“Le Roi Soleil,” or “The Sun King”. 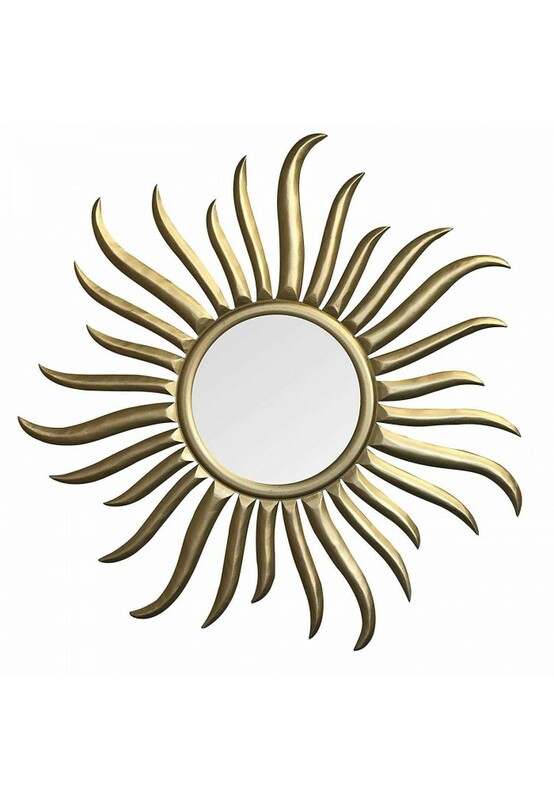 DecorShore’s brilliant gold sunburst mirror is tastefully crafted in the decadent, romantic fashion that was typical of the French Rococo Movement in the Late Baroque Period. Durable MDF Wood is hand-carved into a beautiful frame featuring scrolling golden sun rays surrounding a 12 inch inner-mirror. Each three dimensional wooden sculpture is then sanded by hand to a smooth wooden finish before being elegantly dressed in the typical “gilded” fashion - hand-painted a lustrous gold. The addition of the 12” mirror makes this piece a functional art piece that can serve as the crown jewel of any room or as a well-chosen designer accessory in your palatial room boasting the best of maximalist decor. The Inspiration: The Palace of Versailles was a mere hunting lodge belonging to the father of King Louis XIV before the forward-thinking Emperor transformed it into the grand palace that still stands today. A castle estate featuring over 700 gilded rooms, and a seemingly infinite number of decorative accents, The Sun King was particularly fond of artistic renderings and decorations of the sun symbol. Famous for his commissioning of the Hall of Mirrors, showcasing floor-to-ceiling windows across from a corridor of well-placed, arched mirrors. The illumination from the sunlight lit the palace aglow in stark contrast to the normally dark world of stodgy, Baroque-era architectural & interior design. DecorShore commissions unique home furnishings & decorative accents. Because of the intricate nature of these handcrafted masterpieces, this piece is extremely limited in quantity per each production lot. 35 inch Ornamental Sunburst Wall Mirror Inspired by the Opulent Decorative Art Stylings of the Sun King, Louis XIV. Constructed of Durable MDF Wood and Featuring Lustrous Gold Finish. Artisan Hand-Carved Using Traditional Wood-Working Methods. 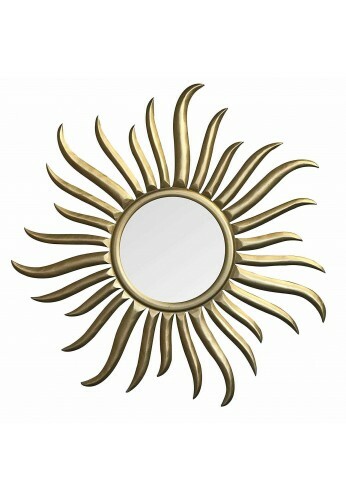 Decorative Wall Mirror Features a 12 inch Center Mirror to Reflect Surrounding Decorative Accents. Detailed Sculpting; Flowing Lines and Asymmetrical Curves that Dominated the Rococo Style Art Movement of the Late Baroque Period in France and Europe. Inspired by Decorative Stylings of King Louis XIV and the Palace of Versailles for a Classical Golden Art Piece. With Magnificent Attention to Detail, Each Piece of Stunning, Bespoke Wall Art is Truly One-of-a-Kind and Limited in Availability.